Evanescence is a city that is class driven and its inhabitants incredibly vain. They live with much of their world controlled by electronics and robots, and their careers, and often marriages, are mapped out for them. The virtual world of computer game, Nexis gives people the ability to be whoever they want to be. The author takes the time to give us a good grounding in this futuristic world. For me, the first half of this book was slow going. The story was interesting, but quite dense and I really had to push through. The second half of the book was as fast as the first half was slow. I whizzed through it, eager to turn each page and follow Ella's journey. Desperate to find out what is at the end of the game, who Guster (her love interest in Nexis) is in the real world, and who was responsible for Ella's current predicament in life. Many of the issues explored in Nexis can easily be translated into issues we face in our world today. I couldn't help thinking that this book would be great for high school students to study. They'd be reading something engaging and fun, but also relevant. By the time Nexis came to an end, I was completely wrapped up in Ella's world and didn't want to leave. I'm looking forward to reading the next book in this series, Redux, which is due out in December. A.L. Davroe grew up in Connecticut and, after traveling to many countries, many states, and many fantasy realms - sometimes even living in them - she has decided that Connecticut is a wonderful little state. She likes books, cats, chai tea lattes, and the word "chime." By day, A.L. makes cheese for a local artisan dairy and, by night, A.L. writes in various sub-genres of adult and YA fantasy, science fiction, horror, and romance, but most of her work tends to have a revisionist twist to it. You can follow her various forays into aesthetic merriment and misbegotten shenanigans on Facebook or Twitter and you can check out her current musical obsessions on her website. 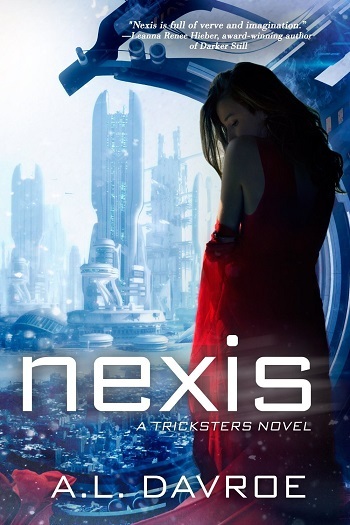 Reviewers on the Wicked Reads Review Team were provided a free copy of Nexis (Tricksters #1) by A.L. Davroe to read and review.